Rain, rain, rain. Three words that summarizes the weather on Krista and Andrew’s day. But, as a designer, I LOVED it! I’ll let you in on a little secret: I LOVE the rain. I do my best work when it is raining. Something about the beautiful, glistening rain drops falling out of the sky, makes me want to write poetry, paint a romance and dream of stolen kisses under an awning. Krista and Andrew didn’t let the rain put a cloud over their day. This day was simply about love and family. And, I think their love for each other was so bright, I am not sure they even noticed the rain. The little details of their wedding were among my most favorite ever. Krista spent several years abroad in Europe. These years influenced her style and tastes. The menu was very thoughtfully designed to incorporate flavors of Europe. Guests were greeted to a fresh Pimm’s cocktail upon arrival (something I instantly fell in love with), see recipe below. To top of their delicious cocktail, they served Curried Cashews as bar snacks. Hors d’oeuvres included Liptauer on a Rye Crostini. During dinner, an artisan bread basket of Lavosh, Pumpkin Seeded Rustic Rolls and Rye bread graced the table. Our vegetarian guests were not forgotten, which was something very important to Krista and Andrew. In conjunction with Abraham Catering we created a beautiful vegetable tower of Roasted Portabella Mushrooms, Zucchini, Squash, Roasted Pepper and Spinach with a Tomato Fondue and warm Goat Cheese Drizzle. It was such a beautiful plate; the carnivores were ready to dine vegetarian that night. Perhaps, my favorite part of our dinner was a well-planned children’s meal of Fresh Pasta with Garden Vegetables and a Light Cream Sauce with a side of Vegetable Sticks and Hummus. 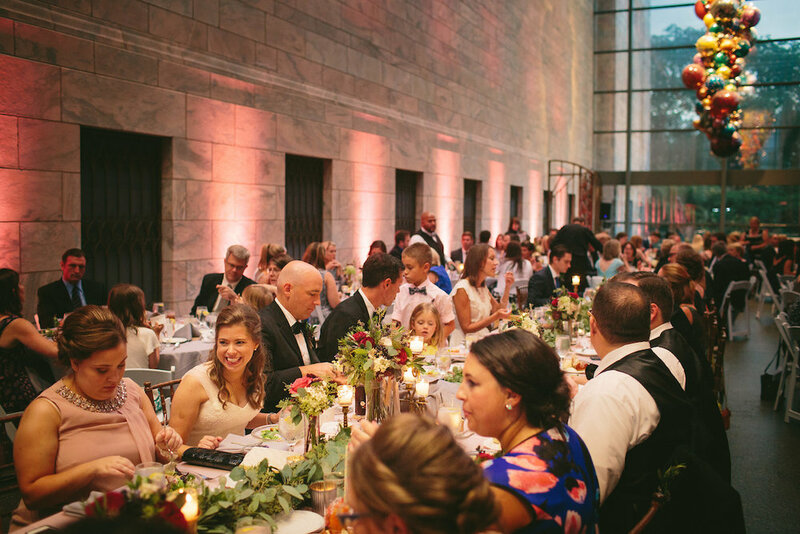 With a single bite, every guest felt the romantic European flare that Krista and Andrew wanted to share. Later in the evening, when dancing began, and guests were feeling the midnight munchies approach, the couple served A&W root beer floats with vanilla ice cream from the local E-Creamery. To add a salty and savory touch, the floats were served alongside a Pommes Frites station with curried ketchup and mayo. This, of course, was in conjunction with the vanilla cake adorned with assorted fresh berries and vanilla buttercream made by The Chocolates Bar. Perhaps the sweetest addition of all though, a Kransekake made by a family friend. If you haven’t had a Kransekake, stop what you are doing and go find one, they are amazing. In fact, I think I need to make sure I have one at least once a year. The food in itself was a well-thought out adoration of Krista’s European past, and the flowers also spoke to the same.The flowers were provided by Found and Flora and met Krista’s dream of incorporating many family serving pieces and antiques in a country garden style, they were beautiful. Creams, greens, with pops of berries, burgundy and soft purples adorned the tables. Family members, vintage birdbath champagne glasses and sprigs of lavender, resting in a grey velvet bow on the napkins, topped off the head table perfectly. It was a stunning memorable day and the rain only made it more special. It was the perfect accent to a perfect wedding. Muddle mint, strawberries and cucumbers in a pitcher, add Pimm’s and the lemonade. Let it sit for about an hour. Pour over ice into a Collins glass. Garnish with a spring of mint and an adorable paper straw.